The new 2015 Mercedes-Benz GLA compact luxury SUV will launch next year and it’s getting better with a new exclusive variant. Mercedes is launching the all-new 2015 GLA next year and the newly introduced Edition 1 variant will get exclusive appointments and get things started by cranking the GLA up a notch. The new GLA is a first for Mercedes in the compact SUV segment and they are doing it right. As Mercedes will attract and win over a new generation of buyers to the German brand, the GLA-Class will play a big part. They’ve already launched it’s stablemate, the new CLA-Class four-door coupe that is selling extremely well. The GLA will be the next new luxury compact model that should attract numerous new buyers to the luxury brand as well. Mercedes has a lofty goal of becoming the number one luxury brand leader in the world by overtaking rivals Audi and BMW. The new 2015 GLA Edition 1 will help launch the new luxury compact SUV next March and get it started in an exciting way. After the successful global premiere in Frankfurt, the GLA is already being anticipated by a younger generation of buyers. The new GLA Edition 1 will definitely crank it up to an even higher level. It comes with exclusive extra both inside and out. GLA Edition 1 buyers will be treated to a first-class “Desert Dust” interior with nut brown leather and Alvorada fabric with exclusive moccasin stitching, 3-spoke multifunction leather sports steering wheel, stainless steel sports pedals with rubber studs, aluminum trim with trapezoidal grain air vents with nozzle ring and cross element in silver chrome, cord floor mats with stitching in the appointments color and black roof liner. Lighting plays a key part in creating a special feel in the cabin, and the GLA Edition 1 will have a unique ambiance inside. It will feature special illumination of the center console, both make-up mirrors, front door sill panels with Mercedes lettering, front and rear footwell lighting, and rear lighting with integral reading lamps and locator lighting. The new GLA-Class is already a head-turner, but the Edition 1 will attract attention from the street with exclusive treatments like bi-xenon headlamps, 19-inch AMG light-alloy wheels finished in high-gloss black, a black radiator grille louvre with chrome inserts, black-painted exterior mirrors, black waistline trim strips and dark-tinted glass starting from the B-pillars. Edition 1 will also come in exclusive exterior colors. The special edition will be available exclusively in the paint finishes cirrus white, orient brown metallic, mountain grey metallic and designo magno mountain grey (from autumn 2014). Unique "Edition 1" lettering on the front wings will further set it apart from the standard model. 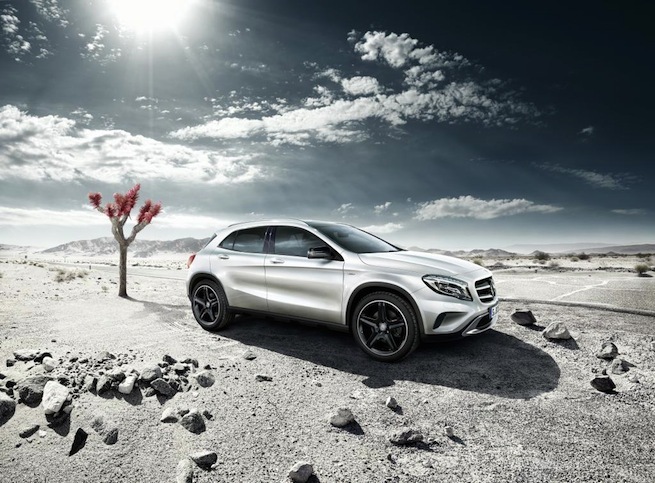 The new 2015 Mercedes-Benz GLA-Class will no doubt be a big hit with millennial buyers around the globe. But the new GLA Edition 1 will be a special variant to boost the market launch next March 2014. Mercedes will make the exclusive model available to order from the end of November for approximately one year after market launch. Tell us what you think of the new GLA and the exclusive Edition 1 model.